U.S. Flag Store's Alabama State Flag is printed in America on Nylon flag fabric. Since this flag is made in America, U.S. Flag Store is able to ensure that the complex State emblems are printed with accuracy, sharp detail and bright colors. This outdoor Alabama State Flag is finished with the same high quality materials as all of U.S. Flag Store's US flags, and is extremely durable and long lasting. Design: A crimson St. Andrew's cross on a white field, where the bars that form the cross are never less than six inches broad and extend diagonally across the flag. The flag can be a square or a rectangular shape, as the legislation that created the flag never specified its shape. Since the bars must be at least six inches wide, smaller replicas of the Alabama flag do not legally meet the flag's definition. Meaning: The cross shape is a tribute to the state's past, as two previous flags that flew over Alabama had somewhat similar designs. The current flag of Alabama is the second official flag in the state's history. While the State of Alabama joined the union in 1819, it did not adopt a flag until it seceded from the union in 1861 during the Civil War. A group of women from Montgomery designed the flag and revealed it as the Secession Convention on January 11th, 1861. Since Alabama had left the union, many referred to the flag as the "Republic of Alabama Flag". The flag did not fly for very long, as one month after it was premiered a severe storm damaged it. The flag was moved to the office of the Governor to be repaired, but would never be flown again. For the remainder of the Civil War Alabama flew the Confederate flag over their land. After the Civil War came to an end, the American Flag flew over the state of Alabama until a new flag was designed. On February 16th, 1895, Alabama Legislature legalized the "crimson cross of St. Andrew on a field of white" in the Acts of Alabama. The shape of St. Andrew's Cross, also known as a saltire, has been used in many different flags. 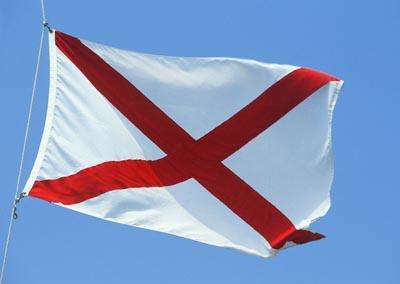 While the Spanish Empire reigned over the land that is now Alabama they flew a flag with the St. Andrew's Cross on it, as did the Confederate Army during the Civil War. Therefore, the design of Alabama's state flag is a tribute to the history of its state.